BELGRADE – In the National Library of Serbia expert processing of extremely valuable collection of books from the personal library of late Patriarch Pavle is in progress, reported RTS. Most of the 8,000 books has dedication of the author and publisher to His Holiness and they belong to the Library of the Patriarchate. “The Legacy contains the New Testament, which is parallelly written in Greek, Latin and Italian, and there is also the “History of the first Serbian Orthodox Church and School Community in Australia”, as well as the book about Johann Sebastian Bach”, said coordinator of the expert team of National Library of Serbia, Dubravka Simovic. These and about 7,000 more books from the personal collection of the 44th Serbian Patriarch have been entrusted to the expert team of the National Library of Serbia, who will process and publish an electronic catalog by August 2014. It is also interesting that most of the books have, in addition to dedication, the signature of His Holiness, and among them are those he received as gift while he studied. So far more than 1,000 books, mostly monografic publication in Serbian have been processed. “We have books on art, we have literature, philosophy, natural sciences, medicine, agriculture, so we can basically say that this is a library of a true intelectual,” said Dubravka Simovic. After the Library processes the books, the catalogue will be printed, and on the website of the National Library of Serbia can even now be found data on processed books with dedications. 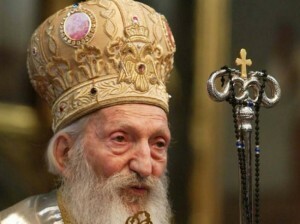 The library of late Patriarch Pavle will be returned to the Memorial Room in the monastery in Rakovica after processing.